Connect mind, body & spirit at this breathtaking, intimate beachfront eco-resort. 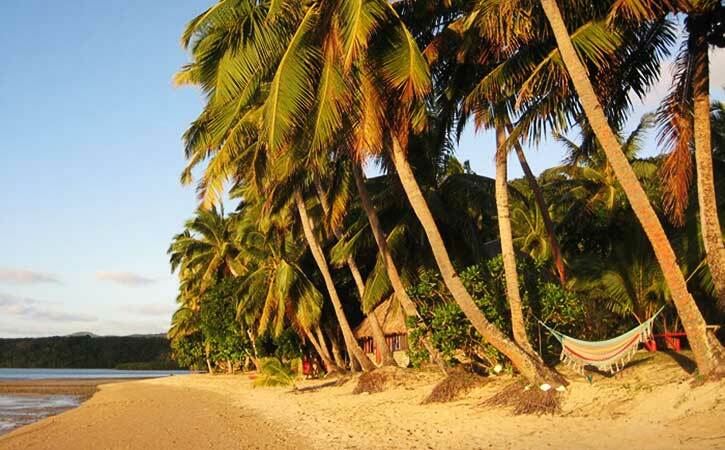 Accessible only by boat, discover this remote South Pacific oasis set on Malawai Bay on the north coast of Kadavu. Stay in one of their traditional Fijan bures that blend island charm and modern luxury, and enjoy easy access to world- renowned dive sites in the Astrolabe Reef. The rare Kadavu Shining Parrots are commonly seen in the gardens, which are not found anywhere else in the world. Full / queen sized beds, large bathrooms with hot showers and fresh water, a mini refrigerator stocked with refreshments, a mini-bar, coffee and tea making area, and ceiling fans. A complimentary basket of fruits fresh from the garden is ready for your enjoyment on arrival. Garden Villa – A unique private Bure, placed in a beautiful garden setting, with a wonderful ocean view. Elegantly appointed with a large private bath and shower and large living quarters with a living room and seperate bedroom. Garden Rooms -Located approximently 125 yards inland, each room shares a wall and a front porch with it's neighbor. The rooms have generous ensuite bathrooms. Located near the feeding area of the Shining Parrots, these rooms are designed with two rooms intended for couples and two larger rooms intended for families or groups. Ocean Bures – All are built within a few dozen feet of a white sand beach. Each is surrounded by an aromatic gardens of exotic flowers and jungle plants, with the rush of waves to lull you to sleep and an orchestra of birdsong to wake you in the morning. Each Bure has an ensuite washroom with hot and cold (drinkable) running water pumped from a sweet spring high in the hills behind the resort, a leak-proof roof covered with grass to cool the inside under a tropical sun, plus walls of louvered shades through which is carried the scent of blossoms on the cooling ocean breeze. Stylish furniture, smooth wooden floors and Fijian wall decorations complete each bure. Royal Bures - A luxury traditional ocean-view bure with all modern furnishings and three luxury bed rooms, as well as its own kitchen and dining room. Ideal for families, Groups, Conferences, and Executives wishing exclusive private facilities. The Great Astrolabe Reef, the 3rd largest reef in the world, is a 110 km long barrier reef, running from the southeastern tip of Kadavu toward the north, around Ono Island and further to the north. Rated as one of the world's premier dive locations, the reef offers an amazing mix of corals (both soft and hard) and large fish such as the gentle Manta Rays. The experienced divemasters at Papageno Resort offer some of the world's best dive sites in the emerald waters of The Great Astrolabe Reef, where the visibility often exceeds 35 meters. The Papageno Dive Shop has been upgraded substantially in 2006. New Scuba Pro BCDs, Regulators and gear were purchased as well as an additional 28-foot dive boat. They are currently offering various dive packages varying from 3 two-tank dives to 8 two-tank dives. Ask us about our current specials at Papageno Resort!